I RECENTLY found myself at a loss for words when asked by a group of white South African ladies if I was not offended at seeing them use the “(black) power salute” during an anti-Zuma picket, and if it was all right for them to ‘borrow’ it for the occasion. 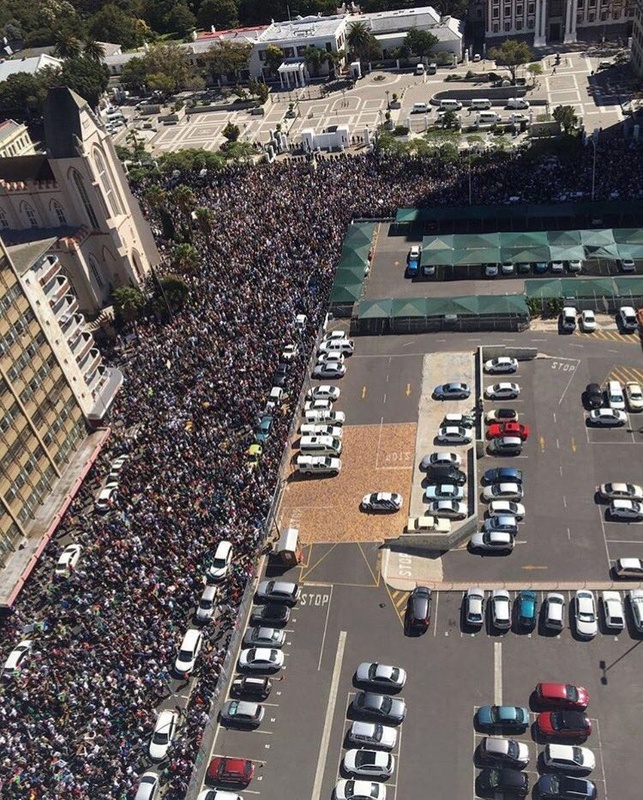 This was immediately after a picket organised by civil society, outside Parliament in Cape Town. First of all, I wondered why me? Because I happened to be a black dude passing by? On whose behalf did they expect me to give or deny permission for them to use the power salute? It was a moment of total clumsiness all round. I could have given a short, playful, answer that went something like: “Sure, why not; I’ll take responsibility for your use of the salute just this once – but don’t tell anyone.” But I chose to address the matter right there, and told them they were silly to even ask for permission from a stranger like me. “Are you not also tax-paying South Africans?” I asked them, to which they responded yes. “Then go ahead and express your gatvolness the best way you feel comfortable, within the law,” I told them before asking them to pose for a picture, with which they merrily obliged. Now, our divisive history of institutionalised apartheid (and you can even go as far back as colonialism if you want) has messed all of us up in a bad way. It has messed up the way we see ourselves as humans, damaged the self-esteem of many, and messed up the way we see ourselves vis-à-vis our fellow South Africans and, in some cases, other humans. Some of us have long acknowledged this, others haven’t. The latter are either still in denial or haven’t woken up to it yet, but it will come in time. Having acknowledged it, most black South Africans have been doing something about it for decades. They have been demanding recognition and respect, as humans. They have even, in post-apartheid South Africa, legislated against discrimination. On the whole, they know that they’ve been messed up as a result of being told over and over again, from their apartheid childhood, that they’re good for nothing, unintelligent, and that they were designed to serve whites and be reliant on them for all else. Sadly, millions have internalised these messages so damaging to esteem, to the point where they either worship whites or the idea of whiteness. White envy is rife in many such victims of decades of indoctrination. In others, it is rage; rage driven by a realisation that came late that the oppressive indoctrination shouldn’t have happened in the first place, or that it could have been stopped much earlier. Many South African whites, on the other hand, live with the undeclared and, for others, unacknowledged guilt of apartheid and, probably, colonialism. For many, it is a very difficult topic to discuss. It makes some uncomfortable and ashamed; it fills others with a sense of guilt that so much inhumanity was dished out in their name, right under their noses, and that they simply enjoyed the benefits of it without asking too many questions. Many of those benefits persist to this day, but few are prepared to acknowledge them for what they are. They blatantly refuse to connect the dots, attributing all their gains to “hard work”; no link to historic context. These are the “for God’s sake, let’s move on” brigade who insist that apartheid is long gone and should no longer be spoken about. Accordingly, all the problems we face today are as a result of incompetent and corrupt post-apartheid political leadership. They are wrong, and they are right. The psychological relationship white South Africans have with apartheid and its lasting legacy cripples many of them. It makes them vulnerable to abuse by desperate political opportunists. Because they haven’t honestly come to terms with the evil that was meted out at black South Africans in their name and for their benefit, many crumble at the first sight of the dreaded race card. They do not know how best to deal with it other than through denialist rage or complete withdrawal. And many don’t dare look current political leaders in the face and tell them where to get off, without fearing the race card being waved in their faces like a cross in the face of Dracula. As a result, many choose not to engage politically. They remain quiet, silently carrying their historic guilt, unsure of how to engage in protest action against modern day sociopolitical injustice and abuses. They will participate in protest events only when there are good numbers of black protesters around. Any absence of black protesters, they fear, delegitimises their unhappiness. It is a strange world when legitimate citizen protests that are not “black-empowered” fail to gain recognition for what they are. Political opportunists know this very well and they will play with it. They will, from time to time, pull out the race card to silence white (dominated) protests and drive a wedge between South Africans. It serves their purposes that we remain divided by racism – real, imagined, or manipulated into places where it is absent. Their interests are not always in line with the ideals of the diverse society we strive to be. Sadly, none of this will change for as long as white South Africans fail to deal, once and for all, with the crippling psychological legacy of apartheid. The current madness happening in our country needs all South African voices, black and white, to cry in unison against the perpetrators. This is a brilliant, thought provoking article. It makes me want to write a detailed response directly to Mr Moeng. Hi Solly , it was your sons birthday when we last discussed these fantastic issues. So it's high time for a further chat. Ive just spent t a week on holiday in the Transkei.. what a beautiful place. I was with 2 other white couples and all our white kids ... it was so far from anywhere and the roads so bad that you needed a big 4x4 to get there. More trappings of white privilege. But the purpose of my chat today is to recount an event that occurred on the way there ... I was stopped in one of those infamous speed traps in the Transkei ... 87 in a 60 zone ... anyway I've been trying to learn isixhosa over the last year ... I'm really ,really ,bad at it ... but I try .. so I got out of my bakkie and greeted the lady cop in Xhosa .. I apologized in Xhosa and explained that my Xhosa is really bad but im trying to learn ... also in Xhosa ... she looked at me and smiled and said come to the back of her car ... she made a big show of getting her book out and explaining that the fine would be R1500... the joys ... then she said something strange ... she said .. wait for the germsn over there to leave with his fine ... so we waited ... then she said ... I'm going to make this go away .... I asked her why ... she said ... because you need the money for Xhosa lessons ... you're really bad , but you're trying ... have a nice day ,... I thanked her in Xhosa and almost gave her a kiss ... I Learned something that day ... we don't need to apologize.. we need to show respect by learning the language of the majority .... I wish you all well. Thanks for your interest and invitation to proceed. My concern now is that this is such a complex subject that my response will turn out to be longer than your original article. I am not an academic writer so it will take me a little while to compose my thoughts in a coherent form. I am not familiar with the "Blog" format so I had intended to put my ideas down as a free standing "essay" to be emailed as a pdf. Perhaps I should simply cut and paste it into this space? Anyway I am working on it and will get back to you as soon as possible. Hello Solly, I first saw this article on Fin24 and, after reading over and over, I took the liberty of sharing it on my Facebook page. Your observations resonate with many of my peers - old white guys in their sixties - but, as you so eloquently put it, we shy away from confronting the real issues! Thank you for the wake up call.